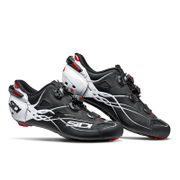 The Sidi Wire Carbon Vernice Cycling Shoes deliver ultimate performance without compromising comfort, and is versatile for both road and MTB cleats. Tecno-3 Push system, an adjustable heel retention device and a soft instep fastening device will keep feet fully supported and snug, perfect for riders who want efficient power transfer with the optimum fit. - R.K.
Upper: Microfibre Performa Tech Pro. Sole: Carbon. 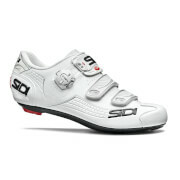 Top-of-the-line cycling shoemaker SIDI delivers again. The Wire Carbon Vernice is super in comfort, adjustability. 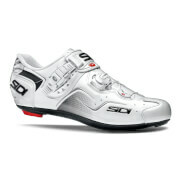 I expect the legendary SIDI durability to be proven again after a few years of use. Half-size over usual size gives ample room for otherwise skinny shoe. ProbikekitUK shipped quickly. Highly recommended.